“Do not fear, for those who are with us are more than those who are with them.” Then Elisha prayed and said, “O LORD, I pray, open his eyes that he may see.” And the LORD opened the servant’s eyes and he saw; and behold, the mountain was full of horses and chariots of fire all around Elisha. From a Christian perspective, traditional planning tools are out of alignment with the way God works. A plan for harvesting would have waited four more months, but Jesus, who knows the true situation, says “Look up! !” His urgent message is that the fields are ripe for harvesting at this very moment! And while you are waiting for circumstances to dictate the right time to get to work, others are already earning their wages, like – right now! Get a move on! 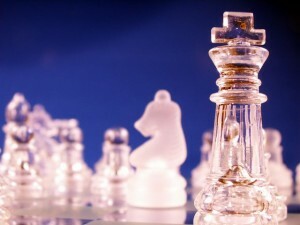 What strategic plan would ever have dared lead the Israelites out of Egypt only to corner them against a sea? What strategic plan would have ever conceived of conquering Jericho as God intended to conquer it? What strategic plan would have brought salvation to the world through a peasant born in a cave in what most people at the time thought was a backwater, no-account country? The Bible declares that God is on a mission and is unstoppable as he works to fulfill it. His strategic options are bounded only by his mission. Circumstances are acknowledged and then blown away by a God who can do miracles. As his earthly representatives, as God’s agents in mission, we can do no less than Paul who steadfastly pursued his call and relied on God to work things out however he would. As I’ve written before, the world would be a different place today if the apostles had tried to write a strategic plan. Traditional planning tools can be helpful, but they should not be the primary drivers of Christian ministry strategy. While a business may look at its strengths and its environment, and decide to enter a new line of business that presents more opportunity and a greater financial return, a Christian ministry has a fixed mission that it cannot change until it has been accomplished. Ministries can take account of their strengths and environments, but they don’t change their mission because of them. Which comes first – the limitations or the mission? The mission, of course! God has called churches to the full mission of the church and he has called specialized ministries to particular parts of the church’s mission. A ministry does not have the freedom to do anything that circumstances allow, it must work on its assigned mission. We are not free to say, as a business can, “What can we do with our people, our experience and our resources?” We might clarify the mission from time to time and find fresh ways to state it, but the underlying mission remains the same. At CCCC, our strength is in our staff and if we look at opportunities and strengths we might discover that we could do more good by serving the poor and funding it with grants. Maybe there’s a lot of government funding for that activity. I don’t know. What I do know is that as worthy as that cause would be, it’s not the cause God has called us to. We have been called to serve the church in Canada by providing our expertise to churches and agencies. A ministry’s strategic planning is not based on leveraging assets but on solving a problem. The problem is that people need to know God and experience his love. How do we bring people to Christ? How do we create more justice in the world? These are problems that Christian ministries are called to solve. The appropriate strategic planning model for Christian ministry is the same model used by many relief and development ministries, the theory of change/logic model. A group discernment process to be clear on what we understand God’s call to CCCC to be. The output will be a set of strategic statements. The mission statement (or End statement in Carver policy governance terms) can be considered the statement of the problem that CCCC has been called to solve. A theory of change will be developed which makes explicit what we believe about how we can solve the problem. For example, our implied theory of change to-date is that most of the problem can be fixed by education and awareness, which is why we have the conference, the Bulletin, regional seminars and so on. Is that a valid theory of change? The strategic review will probe that question. Once you have a theory of change, then you can build a logic model to show what you are going to do to solve the problem, what you need in order to do that, what you expect to happen as a result of your work and then what you think the consequences will be further down the road (hopefully the problem is solved!). Once you have the logic model you can develop the strategic initiatives that will ultimately be incorporated into your annual action plans. Next you can address the business model that will deliver on your plans. This includes organizational structure, revenue model, and other operational aspects of making the core ministry happen. Lastly, you compare what you have designed for the future with what you have today. You check to see if the organization is ready to move forward as is, or if some changes need to be made to align today’s organization with the one that will take you into the future. Where do the traditional planning tools fit in? The environmental scan can be helpful in gaining understanding of the problem and ensuring that the theory of change is comprehensive. It can also help with the development of the strategic initiatives. But all of this is only in a supporting role. The scan may say the problem solving task will be more or less difficult, but it shouldn’t change the task itself. It will likely surface a list of things you should be praying about and asking God to intervene in the situation on your behalf. The SWOT analysis can be helpful at two places: 1) the SW part (strengths/weaknesses) is useful when you are checking organizational readiness and the OT part (Opportunities/Threats) is helpful when developing the strategic initiatives. Remember though, that God works through our weaknesses and God is our defender, so weaknesses and threats should not be deterrents! Jesus did commend people who used their brains and the best of human wisdom (for example, the unrighteous steward in Luke 16) and he challenged his followers to do for him what they would do for themselves (eg., think ahead and count the cost before following him just as they would when building a tower or going to war – Luke 14:27-33), so we shouldn’t be derelict and switch off our minds when planning for our ministries. But if you reduce your plans to what you think you can do with human wisdom and strength, you’ve left no room for God to do what only he can do, and I suspect that when you can do it yourself, God lets you do it yourself! But if you want to partner with God, then make a plan big enough that God has room to manoeuvre and do his thing. I think this is a rather contrarian view of strategic planning, although there is support for it in the literature, so it may have challenged you. I invite you to interact with this post in the comments. 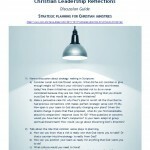 Thank you for taking the time to provide this excellent overview of the strategic planning exercise in Christian ministries. I would like to respectfully provide some comments. I don’t like to view the mission or (Ends statement) of a ministry as a problem. To view it this way from the beginning, initiates the process from the negative. God didn’t want that for us in our ministries. He wanted our light to shine so that others would clearly see what motivates us. Light is not negative. Light is our start. 1. Establishing our Core Values and meeting them every step of the way. These need to be determined and clearly displayed as a first step and referenced throughout. A positive start. 2. Clearly understanding who is in charge – (not us) and what that means in eternity. So as not to lose faith. 3. Being real about our expectations and abilities to engage our staff and volunteers – we’re human. 4. Fully exposing the spiritual gifts we have been blessed with through an exercise designed to help with this. Then we approach the Carver model of governance and planning realistically, understanding that John Carver wasn’t engaging the full extent of our Christian strengths and abilities. His business model or strategy gives us the basics; what we do with it in a Christian sense is much more meaningful and far reaching. Thanks for a very helpful contribution to the discussion, Elizabeth. I really like how Christian spirituality has been incorporated into the process. I take your point about the word ‘problem.’ I prefer positive language too. The gap between the world as it should be and as it is is the change that our ministries want to make. Problem to solve or goal to achieve? Either way, we press on. Thank you for providing another way to think about our mission that is positive and uplifting.